The South African wine industry has struggled with severe challenges over the past few years, resulting in only one in seven wine producers making a profit. Spier Wine Farm belongs to this small minority, but, even more impressively, it has achieved this success with socially and environmentally responsible business practices. Andrew Milne, who took over as CEO at Spier 10 years ago, ascribes this to the company’s strong brand. 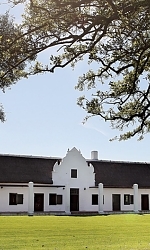 “Spier Wine Farm has been going since 1692, making it one of the oldest wine estates in the country. Great efforts have been made to restore the old farm buildings, and we are investing in landscaping to create an environment that better resembles what the farm used to look like back in the day. “While history creates a great cultural experience, the biggest selling point is the brand’s delivery on quality. People who drink our wines or make use of our hotel or conferencing facilities are used to getting good value. “That is most probably the secret to any successful business; you have to offer both good quality and value in your products,” he says. At the same time, the brand is associated with ethical business principles. “Spier has been investing in sustainable farming practices and the local community for a long time,” says Milne. Spier’s water-saving journey started in 2007, with the installation of water-saving taps and an eco-friendly wastewater treatment plant that cleans sewage and grey water. This water is then used to irrigate the farm gardens and grounds and for flushing toilets in the busiest guest restrooms. In the company’s vineyards, situated at Spier in Stellenbosch, as well as in Helderberg and Wellington, smart irrigation technologies are used to ensure accurate and efficient water usage. Biological farming practices are also in operation, such as planting cover crops and laying down mulch to improve the water-holding capacity of the soil, reduce evaporation and keep soil cool. And Spier Hotel and Conferencing has managed to slash its water usage by 50% over the past year to mitigate the impact of the drought in the Western Cape. Over the past few years, Spier has also significantly reduced its solid-waste footprint. “We educate our employees by making them more aware of the large volumes of waste generated on the farm, the use of recyclable products and recycling, and even take them to landfill sites to illustrate the problem. “Today, less than 2% of the farm’s solid waste ends up at the landfills; almost everything is recycled,” Milne says. Spier has developed various ways of uplifting people in its community. For one, the company provides the base for the Tree-preneurs project in the Western Cape, which supplies seedlings of indigenous trees to people in impoverished communities. The “tree-preneurs“ nurture the trees to a height of 30cm, after which the saplings are exchanged for vouchers that may be used for food, clothing, educational support, bicycles and other necessities. “Tree-preneurs in the Western Cape have grown more than 100 000 trees since the project started here in 2009,” says Milne. The company has also empowered some employees by helping them establish their own businesses. “We have, for example, supported the start of a laundry and transportation services businesses. These projects are not funded by us, but having a secure client like us helps prospective business owners secure loans,” he explains. Milne says one of the biggest challenges for all South African companies, not just Spier, is to be accessible to new jobseekers, while creating an environment in which employees can reach their potential. Spier has various business divisions, with wine production being the main generator of income. Then, in addition to its restaurant, hotel and conferencing services, the company donates land to projects that share Spier’s values, such as the bird rehabilitation group Eagle Encounters, and rents some of its property to entrepreneurs at the craft market and organic farmers. “Managing these versatile offerings is not difficult, as food and wine really pair well together,” says Milne. He adds that it is no longer just the food market that is demanding ethical trade, but that tourists are becoming more environmentally and socially conscious. Before coming to Spier, I used to work at M-Net, MultiChoice and MWEB. Each of these companies was very young when I started there, giving me opportunities to work with many different people and to see what works and what not. I would say the collective inspired me, rather than singling out one person for his or her influence. How did you find the switch from broadcasting to the wine and tourism industry? It was an easy switch, as I have always enjoyed travelling and good food. Some people say you should not pursue a career in something you are passionate about, as doing so might destroy the passion. I don’t agree. Most jobs are about selling something. It is easier to sell something you feel passionate about. I have always responded best to managers who agreed with me on certain targets and then left me to get on with the job. I like this management style, because it allows people to use initiative, be creative and seek out opportunities. People tend to deliver when they feel they are genuinely trusted. Sapiens – A Brief History of Humankind, by Yuval Noah Harari. It is a fascinating book about how humans became the dominant species on the planet and how we all need to work together to address the challenges the earth is facing. According to the book, humans are one of the only species who can actually work together based on myths – in other words, beliefs that unite them. What do you do for relaxation? I love travelling. It does not really matter where. There is nothing like a change of scenery to reload the batteries and give one perspective. Finweek is South Africa's best selling business and financial weekly, delivering news, analysis and investigative reporting of the highest calibre to readers who are serious about managing their money and succeeding in business. Visit our InfoCentre or website.